Once starts out three months after Eve ends. Eve has been living in Califia, the city filled with women, and missing Caleb. He sacrificed himself in order to get Eve to safety, and she hasn’t stopped thinking about him since. 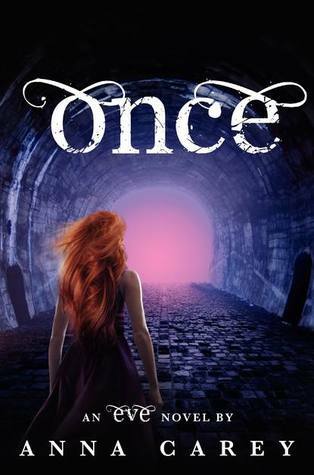 The story takes off from the first pages when an unexpected friend shows up and Eve is once again on an adventure. Honestly, I think I enjoyed Once more than I enjoyed Eve. This book opened up a lot of doors for Eve and her story. We discover some things about herself that she couldn’t have even imagined. She meets Caleb again and together they make plans, once more, to get out from where they are. I love Caleb’s character to pieces and I really wish there was more of him in the story. That was one part that I loved about Eve. Seriously though, the end of that book made me so angry (in a good way). That cliffhanger is (Oh. My. Goodness.) I pretty much can’t wait for book three! (More Caleb). 🙂 Once is out now! 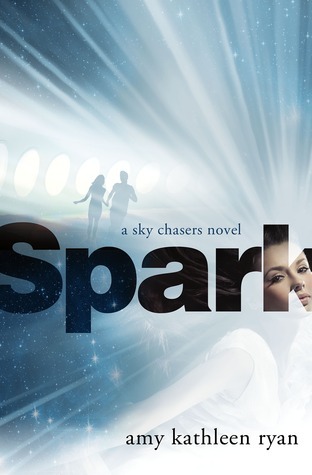 Spark is book two in Sky Chasers series. The girls have been reunited with the boys, their mission now is to chase down the New Horizon and get their parents back. Waverly is still recovering from what happened to her on New Horizon. Kieran is still trying to keep the ship from falling apart. Seth is still being blamed for everything. Book two is told in three different points of view, which I enjoyed a lot. We get to see a bit more Seth in this book which made me happy. Confession, I’m a big Seth fan. I know, I know, thats crazy considering he’s a total crazy person in book one but there’s just something about him. Before his crazy stage I really enjoyed his character and I didn’t feel like giving up on him. Good thing I didn’t! I really liked him in this book! I also enjoyed Waverly’s character growing and Kieran’s. They have to make some tough decisions and both become better for it. I’m excited to read what happens next. Spark comes out July 17th! Great reviews! SPARK interests me most, particularly because the cover is just absolutely sparkly (ha) and beautiful. Cleanly done. I love it. I haven't read EVE so the description is a little confusing, but I'm curious about this New America place. I really enjoyed Spark! It always reminded me of the Across the Universe trilogy. I love futuristic books.